To say that Malaysians are talented is not an overstatement as some of the best–and most impressive–food blogs are authored by Malaysians. I am constantly amazed by the sheer talent of my fellow Malaysians, for example: Billy Law at A Table for Two. A Table for Two chronicles Billy’s eating adventures in Sydney as well as documents delectable recipes from his kitchen. Graced with outstanding food photography plus a keen sense of humor and wicked writing style, I am ready to crown A Table for Two the best new food blog of 2009! 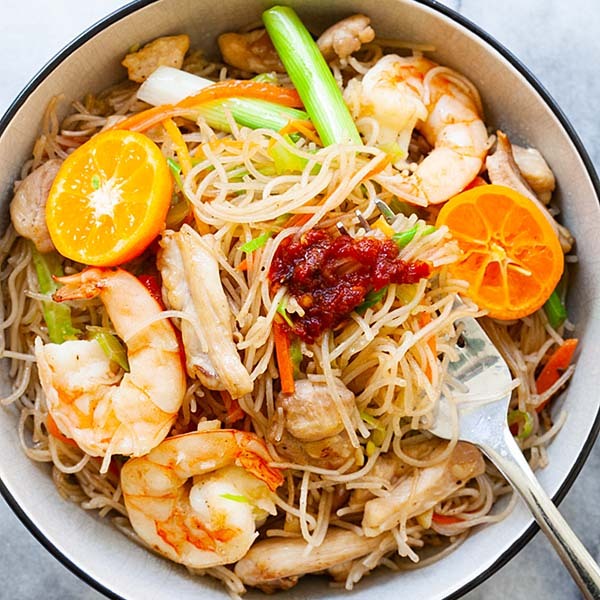 Please welcome Billy to Rasa Malaysia as he shares Ipoh Bean Sprout Chicken (芽菜鸡) recipe with us–a famed dish from the state of Ipoh in Malaysia. I can confirm this – no matter where you are, the only one topic that can reunite all Malaysian expats around the world together has to be food. I am sure you will all agree with me, Malaysian food especially. When Rasa Malaysia asked me to be a guest writer on her blog to feature a signature dish from my hometown, the answer is loud and clear – the most famous dish from Ipoh has to be Bean Sprout Chicken (芽菜鸡) with Sar Hor Fun (rice noodle). 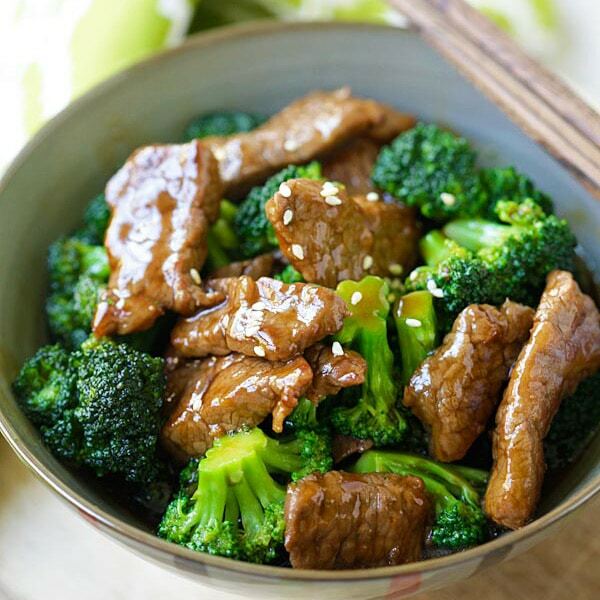 This is a very simple dish to prepare, all you need is patience. The chicken is cooked using the same technique as Hainan Chicken. It is poached in a water bath then quickly dunk into cold water to stop the cooking process to retain its juicy smoothness texture. As for the bean sprout, it will only need to be blanched no more than 10 seconds, then drizzle with sesame oil and soy sauce, and a smidge of white pepper for bit of kick. Sounds simple? It sure is. You might be wondering how can poached chicken with blanched bean sprout and served with just rice noodle in soup can be a big hit in Ipoh? All thanks to its prime location. Ipoh is famous for its food, due to the relatively mineral-rich water (high alkali content) owing to its location on top of a large karstic formation, makes the food especially tasty. Tourists and locals are willing to travel interstate for hours just to have a taste of the delicious food this town has to offer. Another characteristic of this dish is the rice noodle. 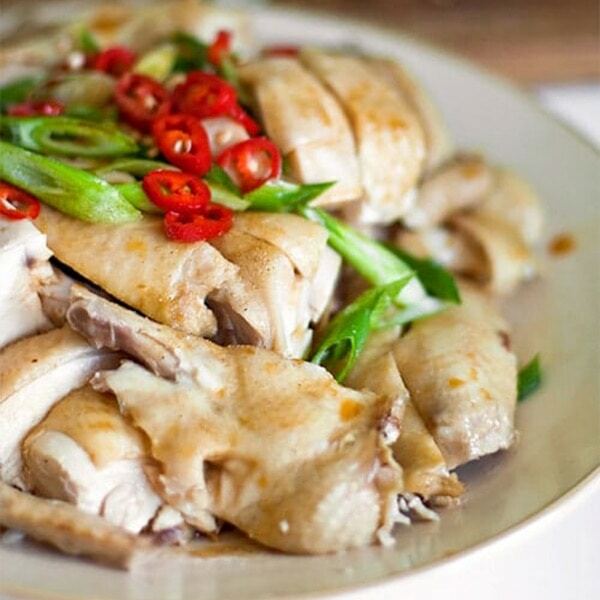 Its slightly translucent look and superb slippery smooth texture swimming in a sweet broth that has been boiled overnight using chicken carcasses is what make this dish popular with the locals. Sadly all I can get in supermarket here in Australia is some precooked fresh rice noodle in packets which all stick together, thick and crumbly. I am in Australia for over 13 years now, the bean sprout may not be as stout and fat, the rice noodle may never taste the same as those in Ipoh, but at least making this dish will always bring me one step closer to home. To make this dish, I would suggest you to go for the best produce as possibly can, especially the chicken. Free range or organic chickens are the best options which gives you a better flavour and texture. Ipoh Bean Sprout Chicken (芽菜鸡) recipe - The chicken is poached in a water bath then quickly dunk into cold water to stop the cooking process to retain its juicy smoothness texture. The bean sprouts will only need to be blanched no more than 10 seconds, then drizzle with sesame oil and soy sauce, and a smidge of white pepper for bit of kick. Bring a large pot of water to the boil. Make sure the pot is deep enough to submerge the entire chicken with the lid on. Place garlic, scallions, peppercorns and goji berries into the cavity of the chicken. When the water has boiled, remove the pot from the heat and place the chicken into the water, neck first. Put the lid on and leave the chicken to stand for 1 hour. Then lift the chicken out of the water and set aside, as we need to boil the water again for its second bath. Bring the pot of water to the boil again. Remove the pot from the heat and put the chicken back in for another 30 minutes bath. The chicken should be cooked by now but sometimes the bone can be still bloody when cut up. If you prefer it to be fully cooked, add an extra 30 minutes for the second bath but the texture of the chicken might be slightly different. Act quickly, transfer the chicken to a large bowl of ice water to stop the cooking process. Important! Do not discard the pot of water bath! It is now a perfect pot of chicken stock ready to be used for the noodle soup later. Once the chicken has cool down, discard all the mixture in the cavity. 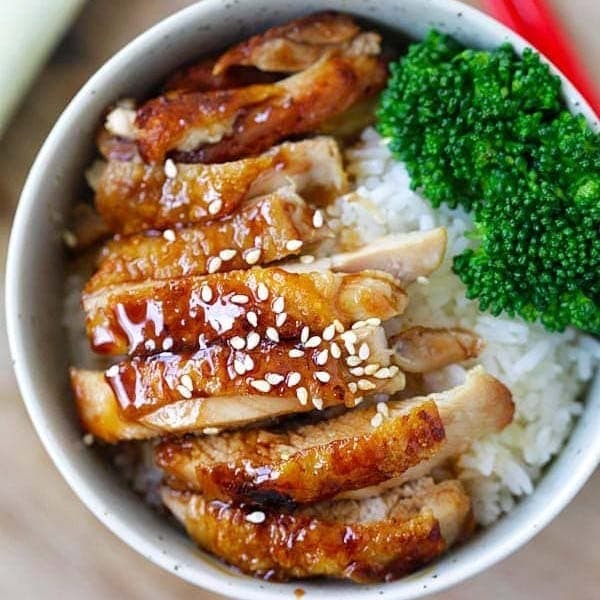 Rub sesame oil and soy sauce all over the chicken and it is ready to be cut up. Garnish with chopped red chillies and scallions, and a good sprinkle of white pepper powder. Place the pot of water that has been used to poached the chicken back to the heat. Add dried anchovies, peppercorns, rock sugar, and vege stock into the pot and bring to boil. Bring a different pot of water to boil. We will use this to cook our rice noodle. Place the fresh rice noodle in microwave for 10 - 15 seconds, now it should be soft and easily to separate apart. Fill a wire skimming ladle with rice noodle, then dip it inside the boiling water for no more than 30 seconds. Take the ladle out of the boiling water, your noodle is now cooked. Drain then put rice noodle in a bowl, ladle the hot broth over the rice noodle. Garnish with chopped red chillies, scallions and coriander. Place the bean sprouts in a wire skimming ladle and dip it inside the hot broth (NOT the boiling water for rice noodle) no more than 15 seconds. Drain and serve on a plate. Drizzle a good dash sesame oil and soy sauce all over. Garnish with chopped red chillies and scallions, and a good sprinkle of white pepper powder. For condiments, chopped hot green chilli padis and soy sauce on a saucer as a dip for the chicken. Ipoh bean sprouts are very good, short and very crunchy. The bean sprouts in the US is too long and the texture is not great. I heard that now bean sprouts are added some chemicals so they are short and crunchy, too. Your Ipoh bean sprout chicken and hor fun looks so yummy. This looks so simple to make and yet the combination of flavours and textures seem like they’d be absolutely sublime! looks so yummy. hope to challenge myself in trying the recipe one day. Ipoh has it’s famous bean sprout is all because of the water, the mountain water that they have for that. Is it traditional to put the chili padis on top of the dishes? Or was it done to add color to the photograph? I’m not from Ipoh, but did eat the Ipoh style chicken and beansprout at a restaurant on Jalan Gasing in PJ almost 20yrs ago. Don’t recall having the chili padis served right on top of the dishes. Usually on the side with soy sauce. Anyway, another method of boiling the chicken which I’ve used for 15 years now can save some time. For those interested, here’s what I do. Bring pot of water to boil (I usually add salt and pieces of ginger) and drop the chicken in (enough water to completely cover the chicken). Now, bring the water back to boil again, cover and remove from heat immediately. Let it “cook” in the pot for a little over an hour (for a 2.5lb chicken for example). Remove from pot and drain the chicken (you can hang it or just prop it up). Brush on some sesame oil. It won’t be bloody even in the thigh area. I usually use Amish chicken in the US. I haven’t tried the author’s method, but I would imagine if you put the chicken in with the pot off the heat, the water temperature would have dropped significantly, thus requiring you to do a second boil for 1/2hr to properly cook the chicken. the chilli padis with soy sauce condiment on the side usually is green chillies and not red. I’ve tried your method once, but I found the chicken is overcook with it in the water and then boil again. If remove from heat the flesh will be a lot more juicy and tender in my opinion. But yes, it does take longer time. Thanks for clarifying. It has been so long that I just refer to them as chilli padis since the ones sold in my local grocery stores label them as “Thai Hot Peppers” and they could be small like M’sian chilli padis, or long like the red/green chilli. Anyway, it’s interesting to see them used as a garnish on soup in Ipoh. I would garnish them say on mee goreng or wuu tao kou (yam cake), but never on soup. I might give your boiling method a try, though the possibility of bloody chicken (thigh) will bring in the health inspector faster than you can say “yum seng” :) or have my wife running for the hills. The method taught by Bee is the best way so that the chicken will not over cooked and nice and the skin will be crunchy. That is the Cantonese method to boil a chicken !! She is smart to ask readers to remove the pot from the stove as in overseas mostly use the electric stoves as the heat will last at least 15 mins. I will add in some fried garlic oil and some Fish sauce to the noodle soup. fish sauce is the secret of most of the hawkers’ food especially the Char Koay Teow !! It simple to fry it in the M’wave !! I mix 2 spoons of chopped garlic and stir in oil to over it, m’wave for 1 min, stir and continue another 1 min but you have to be there and keep an eye on it as it will burn very fast. Once you see a spot is brown in the center of the bowl, stir and m’wave. Once it is slightly golden, remove as it will continue to cook in the HOT,HOT oil !! I always have problem with cooking pak cham kai and now I know I undercook my chicken. The bloody sight from cutting the chicken is horrifying. I will try your method and hopefully this time the chicken is well cooked and the moisture is retained! Is the broth still as tasty from the 2nd bath? I have tried this dish in Ipoh and Kuala Lumpur, Malaysia, I have been told it was the speciality and people love it. I find it very plain and lack of taste, to me that’s a basic boiled chicken with boiled beans sprouts and boiled rice noodles (tasteless by definition)….nothing special after all! So I didn’t undertand the fuss around that dish. Is it because I’m French?! I think the method of cooking is similar to the sous-vide method in French cooking. The uniqueness comes from a perfectly cooked whole chicken that is very moist and the chicken skin actually tastes pretty good when cooked in this manner. Also, with the combination of the chicken rice (though there’s so many varieties from plain yellowish white to darkish yellow brown) and the chilli paste that accompanies it. Again, the chilli paste/sauce has so many varieties depending on where you go. The dish is special in the sense it is so simple, but yet so savory at the same time. shouldn’t the of your recipe be ipoh bean sprouts chicken? I had to agree with Mr Bidendum, I too found this dish to be somewhat plain in tasting. I prefer normal Chicken rice. These sure makes me hungry! If cooked just right, its far from bland and tasteless. Texture should be smooth and succulent, with all the essential juices sealed within the chicken. 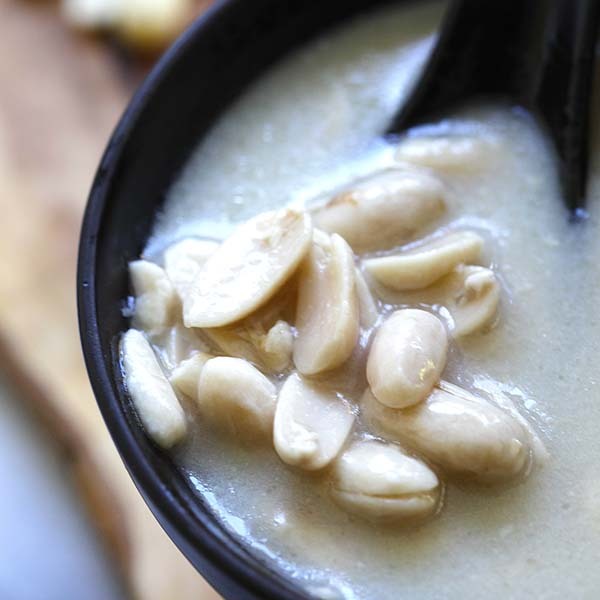 Then dipped into a mixture of soy, ginger and garlic, the taste is pure perfection! Is there any substitute for goji berries? The recipe sounds so pure. I love simple ingredients perfectly done. Yea, sometimes home made is better from what you can buy from outside. I just had ate steam chicken at the New Ipoh Chicken Rice Restaurant at Mid Valley last week. The outlet had just opened after renovation to the outlet. Their food is salty. I think too much MSG. Then price also increased, and the food portion became smaller compared to before renovation. I would like to know if somebody can help me to source some company in Ipoh can provide me the fresh Ipoh bean sprouts and ship to Hong Kong everyday. Hi! We’re Malaysians currently staying in Texas. The chickens here are huge. They are at least 5lbs. What should I do to make sure that it’s cooked? Buy organic chicken or cook longer.